You are here: Home / Android News / What is Amazon Underground? Amazon Underground is a new app store that has thousands of games and apps available completely for free – even those that cost money on other app stores, with no catches. You will be able to download popular titles such as Fruit Ninja, Goat Simulator and Star Wars Rebels: Recon Missions, OfficeSuite Professional 8 and many more. What is most compelling, is that none of the apps that are available have micro-transactions of any kind. 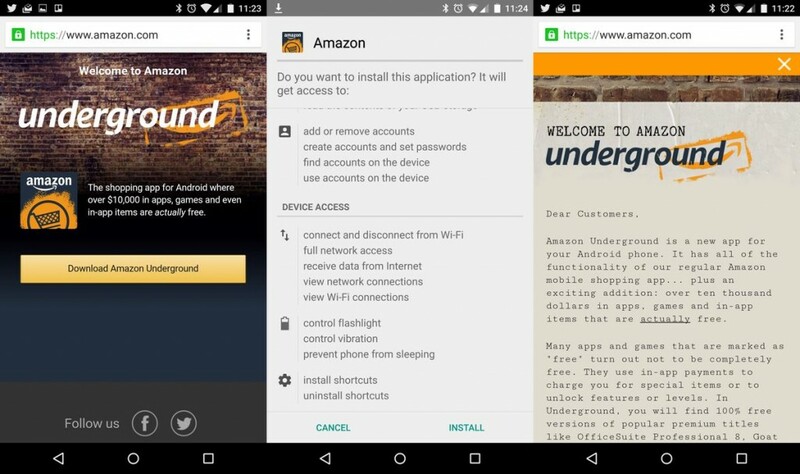 Amazon Underground is redefining the Android app store experience and making the entire process very lucrative for developers. Normally when companies design and make an app they charge a one time fee. Sometimes its as low as .99, in other cases it’s close to twenty dollars. Amazon Underground will give you the app for free, but for every hour that you actually use it, developers will net twelve cents. Amazon is monetizing the Underground platform by running advertisements and the revenues that it brings in will be used to pay for developers. The ultimate hope is that more people will jump ship to Amazon from Google Play, allowing Amazon to generate more profit and in turn woo more developers to put their apps on their platform for free. In order to make the launch of Amazon Underground a success the Seattle company paid hundreds of thousands of dollars to Vine celebrities to hype up the service. To date, these have racked up millions of views and likely contributed to brand awareness for the millennial generation. Things aren’t complete rosy with the Underground launch. Customers have noticed that Amazon got rid of its Free App of the Day program and many people have been wary of installing Underground because of privacy issues. When you install it for the first time it wants access to a litany of personal information that some people are finding intrusive. On the other hand, sacrificing some of your private info to download thousands of paid apps might seem like a good trade-off. Amazon has promised that Underground is not a limited time promotion, but will be a normal way of doing business going forward. You can download Amazon Underground from the Good e-Reader App Store.